Ep.8: Can we yet book anyone one for the win? Ep.10: Is Survivor fair with a secret pair? Ep.12: Rise of the Kiwi Cirie? Ep.13: What to make of Adam's ribbing? With Ghost Island just wrapping up its demonstration of just how slow a Survivor season with no real power shifts can seem, NZ: Thailand thankfully had a major shakeup that, at least temporarily, moved the balance of power back toward a more... balanced position. While the post-swap Khang Khaws adhered rigidly to original tribal lines in the first vote after the swap, this week the long battle between Khang Khaw and Dylan finally paid off: Dylan gleefully flipped to vote with the original Chanis, and original Khang Khaw's ruling tight five alliance lost a key member, Josh. With 12 players remaining, the numbers are now Khang Khaw 6, Chani 5, and Dylan 1. 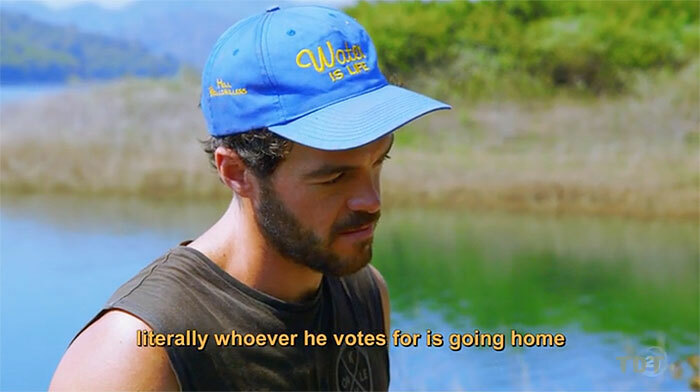 As long as Adam is still around (and with Khang Khaw), Dylan should be a loyal Chani vote, although it's unclear how much longer he'll last after that. With people like Matt (and maybe Lisa) also potentially flippable, there may actually be some hope for the downtrodden original Chanis. (Well, there is after the merge, at least.) At the minimum, they appear to have some game left in them. That doesn't mean that the residual Chanis still marooned on Khang Khaw (JT and Eve) are in great shape. They're still outnumbered, the preview doesn't suggest the merge will save them next episode, and Brad and Tess are almost certainly considering throwing the next immunity challenge in retaliation, considering they already threw one in order to blindside Kaysha. Honestly, having seen the Chanis throwing this episode's challenge in real time, production should have called an audible and fast-tracked the merge for the next episode. If not, we secretly hope that both tribes try to throw the immunity challenge, because that would be (1) hilarious to watch, and (2) should teach Survivor NZ a lesson about having an early merge as an option in case a swap turns sour. There are enough moving sub-groups of people now, that the divisions present would be best tested in a full, 12-person Tribal Council. Just last week, we were a bit worried about Renee, who had never really seemed part of JT and Arun's core Chani alliance. The swap had then left her as the lone woman on a tribe full of men. That didn't go well for Shay last season on NZ: Nicaragua, but rising above our expectations, Renee had a breakout episode this week. Given an alliance to play alongside, she was truly the Chani sparkplug, despite sitting out the first challenge. Maybe the pizza helped. The pizza probably did help in the memory Outpost duel, actually, but Renee really shone during the subsequent raid of Khang Khaw camp: appropriately subdued at the start, where a stressed-out Tara had to reluctantly announce the raid. Then later, she was giggling at Brad's desperate request to leave some of the coffee. Poor Brad didn't seem amused, but it was a nice harbinger of what was to come for the tight five. For someone who had been given a fair amount of screen time throughout the season, but never seemed to be intricately involved in any of the strategy, it was nice to meet Renee, finally. Definitely great to see that here, six episodes in, we're still finding out that there are people here willing to play the game. One of the superfans at Chani (JT? Dylan?) mentioned out loud a few episodes ago that with the merge approaching, it wouldn't be surprising if the other tribe starting booting some of their big, strong guys. Here, with the merge probably no more than one episode away, perhaps Josh's boot wasn't that surprising in the grand scheme of things. But it still felt like a huge change in the power dynamics in the game. It was also a bit shocking because before the season started, Josh seemed to check off all the boxes for an all-around player in the same mold as Avi: Smart, athletic, gets along well with people, has a great backstory. In practice, though, Josh's presence on the show had seemed strangely muted. He was the third or fourth Khang Khaw man in the confessional hierarchy (well behind Dylan and Adam, probably also behind Brad). He seemed to hang with the boys okay, but wasn't shown interacting much with the women. Most importantly, we didn't even hear about his cancer battle until Episode 6, almost eight hours into the season. That suggested something was amiss, and his days on Survivor were numbered. Still, if Dylan was to take anyone from the tight five down, it seemed most likely to be his constant irritant, Adam. Not the accountant who had a secret side-alliance with Arun! So it was a surprise to see him gone so soon. It's also disappointing that Josh did not take his blindside particularly well, but given the physical hurdles he cleared just to get on the show, it's understandable that he might have invested a bit more emotional energy into his personal journey through the game than would the average casual applicant's "Oh, Survivor? Eh, sounds like fun. Sure, I'll try it." Not everyone takes their exit as gracefully as Jay Starrett. At least Josh was unequivocally trying to win. Episode 6: It's a tarp! Um, isn't Chani the blue-and-white tribe? And Khang Khaw is the yellow-and-red... aw, forget it. Is this one of Rob Cesternino's patented Failures in Subtitles entries? It's a *slide* puzzle, Dylan. You're not supposed to just lift the pieces out to move them. Although you could. Whoops. Adam, come on. It's not watermelon pizza. Oh, he meant "give me that pizza *AND* Matt Chisholm." He chose wisely. Finally, on round 267, someone misses a tile. Good call picking the Chani-colored one, Renee. This subtitle is in no way endorsed or sponsored by Pizza Hut, who would like to point out that Renee has long since digested any and all pizza. Aw, don't worry, Tara! We thought they were swapping you for Renee, which would *SUUUUUUCK*! We're cool with losing the tarp and coffee. Brad seems less cool with it. Tea is sort of like coffee, right? It's a tarp! Also Renee. Oh dear God. Do you people not know the direction in which rain generally moves? Nice day for a sulk. Brad is so upset by his lack of coffee that he now thinks he's on Survivor ZN. Adam has acquired himself a nice shrubbery. Khang Khaw finally wins! Hurrah! Renee is very sad about this crushing loss. We had better boot Dylan, or I shall be forced to sulk again. At least I have secret alliance with Matt to fall back on, should anything get... aw, dammit. Come on, Renee, that was hours ago. We can't be expected to remember back that far. Don't look so surprised, Matt. Dylan and Dave are wearing matching outfits, after all. 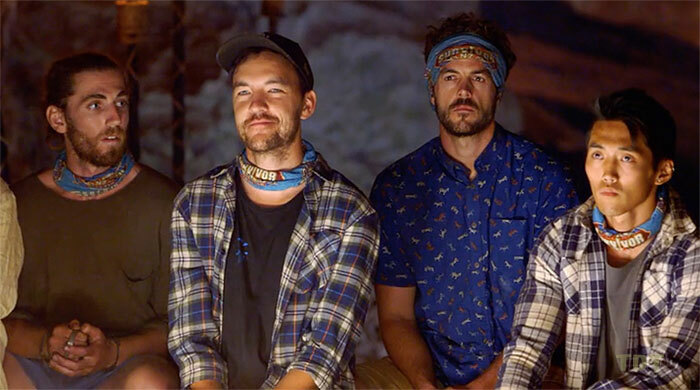 Luke Harries at The Spinoff: "Week 6: A feud takes hold of the island"
Kemper Boyd at PurpleRockPodcast.com: "Episode 6 recap"
Evan Francis at InsideSurvivor.com: "Trust Fall"
Jack Van Beynen at Stuff.co.nz (5/29/18): "Josh Hickford on his 'frustrating' elimination"
Ryan Brink at Brink of Reality (5/29/18): "Thailand Exit Interview | Episode 6"
Kyle & Bryan at 2 Boys Talk Survivor (5/29/18): "NZ Thailand E06 Exit Interview"
Ryan Brink at Brink of Reality: "Georgia Bergerson Recaps Survivor New Zealand: Thailand Episode 6"
Shannon Gaitz at RHAP: "Thailand Episode 6 RHAPup | Randy Bailey"
Estelle Clifford at TheHits.co.nz: "Survivor Radio - Episode 6"